Audra Calloway is a Public Affairs Specialist with PEO Ammo and Spokesperson for The Picatinny Arsenal. Q: What makes ammunition, used by the military, different from even the most advanced ammo used by hunters, or law enforcement, or even tournament shooters? A: In general, Army combat ammunition is designed, manufactured and packaged to function reliably in the most severe worldwide conditions our Armed Forces could face. This includes meeting requirements such as sustained use and storage in extreme hot, cold, humid and corrosive marine environments. Military rounds are also generally designed to engage military-type targets. Q: Can you explain the difference between “Match” grade ammo and “Ordinary” ammo? Does the Army only use “Match Grade?” and if not, under what circumstances does the Army use better than average, or match grade ammo? 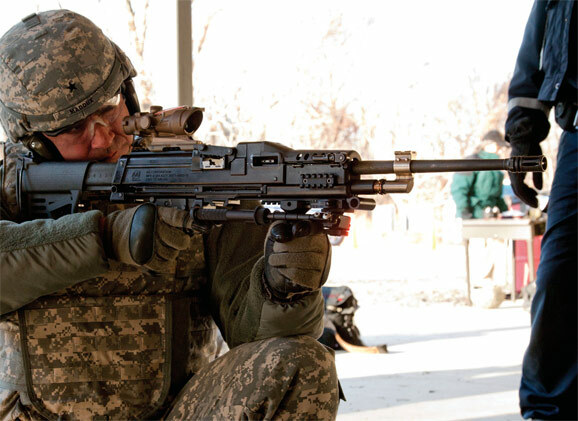 A: The Army designs its ammunition to meet the user’s requirements for accuracy. In some instances, such as sniper applications, the ammunition needs to be very accurate, and is therefore “match grade.” The bulk of our ammunition is designed for general purpose use which includes assault rifles, carbines, and machine guns. In these instances additional production cost to achieve accuracy beyond the user’s requirements is balanced with the capabilities of the weapons. Q: There has long been “controversy” if you will, that the 5.56 and 7.62 NATO rounds, especially in shorter carbines, lack a certain stopping power prompting the need for alternatives – what are your thoughts on this issue and solutions current and in development, within what you are at liberty to discuss of course? A: In 2010 the [US] Army fielded the M855A1 Enhanced Performance Round, a lead-free version of the M855 cartridge that is fired from the 5.56mm family of weapons (M4, M16 and M249) and is the newest of the small caliber family of munitions. It was optimized for performance in the shorter barreled M4 Carbine. The M855A1 EPR uses a new bullet design that resulted in a number of significant enhancements over the original general purpose M855 fielded in the early 1980s. Improvements include better hard target penetration, more consistent performance against soft targets, and significantly increased distances of these effects. The M855 is a good round, but it is yaw-dependent. Like all bullets, it wobbles when it travels along its trajectory. Its effectiveness depends on its yaw angle when it hits a target. The new Enhanced Performance Round, or EPR, is not yaw-dependent – it delivers the same effectiveness in a soft target no matter its yaw angle. The same technology incorporated into the EPR is also being leveraged to improve 7.62mm M80A1 ammunition. Q: What are some of the other particular challenges with designing or developing ammo for use by today’s warfighter, especially as regards CBQ and irregular warfare in terms of range, accuracy and stopping power? A: The M80A1 round will provide similar capability increases for 7.62mm as the M855A1 EPR. The M855A1 and M80A1 are designed to be the best possible general purpose combat rounds for the Soldier. As a result, they must be able to achieve required effects against multiple target types in multiple potential engagement scenarios. Q: What about lead, does that continue to present an issue, and is the Army actively pursuing and deploying “green” rounds? A: As I mentioned, the M855A1 Enhanced Performance Round is a lead-free version of the M855 cartridge. The EPR allows training exercises to be conducted on ranges where lead projectiles are no longer allowed. The Army will eventually replace the M855 with the M855A1 as the general purpose round for combat and training. This same technology is also being leveraged to improve 7.62mm ammunition. Q: Let’s take a step back to some “basic ballistics” – when it comes to factors such as stopping power, accuracy, velocity, range... in the total design of a round what is more important the size of the casing, the caliber of the bullet, or the rifle it is fired from? A: It is an integrated package. No one factor can be singled out as the “most important.” The requirements for the weapon & ammunition systems will drive to the best solution. Q: I am sure you have seen the press releases from Sandia Labs, and videos that exploded over the internet last year of their successful test of a “smart bullet.” While not much has been heard about that since, I am familiar with DARPA’s EXACTO program, and the successful field tests of the XM25s ‘‘smart grenades” in Afghanistan. How close are we to real world “smart bullet” technology? Is PEO Ammo involved with any smart bullet programs that you can discuss?